On the surface, the Gaza Strip looks relatively calm, with few security incidents occurring since the end of the protracted 2014 summer conflict between Hamas and Israel. Behind the scenes, pressure within the Islamist-run enclave is gradually building again, just as it did prior to the 2014 war. Gaza's civilian population is hostage to Hamas's dramatically failed economic policies, and its insistence on confrontation with Israel, rather than recognition of Israel and investment in Gaza's economic future. Ultimately, the civilian-economic pressure cooker in Gaza looks likely to explode, leading Hamas to seek new hostilities with Israel, for which it is preparing in earnest. Right now, Hamas remains deterred by Israel's firepower, and is enforcing its part of the truce. Hamas security forces patrol the Strip's borders to prevent Gazans from rioting, to stop them from trying to escape Gaza into Israel, and to stop ISIS-affiliated radicals who fire rockets at Israel. Hamas is using the current quiet to replenish its rocket arsenal, dig its combat tunnel network, and build up sea-based attack capabilities. 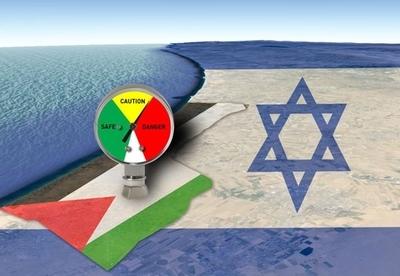 It is investing many resources in cooking up new ways to surprise Israel in any future clash. These efforts have not gone unnoticed by the Israel Defense Forces (IDF). Hamas has not fired a single rocket into Israel since August 2014, but it encourages violence in the West Bank as part of a strategy to destabilize its Palestinian rival, the Fatah-led Palestinian Authority. Hamas in Gaza also works remotely to set up and orchestrate terrorism cells in the West Bank, while plotting way to overthrow Fatah from power. The Shin Bet, Israel's domestic intelligence agency, has successfully foiled nearly all of these efforts thus far, saving many Israeli lives, and the PA's rule, too. A deeper look at processes under way in Gaza reveals why the status quo seems untenable in the long run. Thirty percent (910,000) of Gaza's population of 1.85 million are aged 15 to 29, and out of these, 65 percent are unemployed. This represents one of the highest unemployment rates for young people in the world. Many are university educated and deeply frustrated. The overall unemployment rate in Gaza is 38.4 percent, and rising steadily. Eighteen thousand Gazan university students graduate every year. Most of them have nothing to do with their degrees, and return home to a life of idle unemployment. Many Gazans dream of leaving. The suicide rate is growing. Under Hamas's rule, these young people see no change on the horizon. Out of the total population of Gaza, 1.3 million receive assistance from United Nations aid workers, without which, a humanitarian crisis would likely ensue. Those who dare complain, such as Gazan bloggers, find themselves whisked away into Hamas police custody, where they receive firm warnings to remain silent, or else. Meanwhile, the Gazan population is growing at an unsustainable rate. Since Israel pulled out all of its soldiers and civilians in 2005, 600,000 Gazans have been born. This is a generation that has never been to Israel (unlike the older Gazans), and its only experience of Israel is through air force missiles fired at Hamas targets following clashes sparked by the jihadist regime's military wing. Many of these young people are exposed to the propaganda of Hamas's media outlets, like the Al-Aksa television station, which is a major source of incitement. Some are also exposed to the wider world through the Internet, and are aware that life can be different for them. By 2020, Gaza's population will hit 2.3 million people. It could run out of drinking water. This might prompt a civilian revolt, which could push Hamas into starting a new war with Israel to distract attention. To try to relieve the pressure, Hamas leaders make promises that they cannot keep, such as the setting up of a sea port, and the opening of the Rafah crossing with Egypt, which the anti-Hamas Egyptian government opened just 18 times in 2015 for fear of allowing jihadists in Gaza to pour into the restive Sinai Strip. A Hamas delegation traveled to Egypt earlier this month to try to mend relations with the Cairo government. The effort resulted in failure, after Egyptian officials accused Hamas of failing to acknowledge its collaboration with the ISIS-affiliated Sinai Province insurgents. Changes are underway within Hamas itself, which are causing the Izzadin Al-Qassam Brigades military wing to gain power at the expense of the political wing, which is led by Ismael Haniyeh. Yiyhe Sinwar is a senior Hamas member with growing power, operating in the gray zone between both wings. He is close to military wing chief Muhammed Def, and to Haniyeh. Sinwar's power represents the rise of military wing's influence, where many members are finding their way into political elite positions in Gaza. Marwan Isa is another senior Hamas member, influential to both wings. While the political wing has, behind closed doors, been hesitant to support the military wing's disastrous adventures against Israel, its ability to veto future attacks may vanish. Additionally, Hamas is running out allies as it did before the 2014 war. Iran continues to fund its military wing, as well as Palestinian Islamic Jihad. Yet Tehran's ability to traffic weapons into Gaza has been ruined by Egypt's tunnel demolition drive. Iran's overall influence on Gaza, therefore, is limited. The Muslim Brotherhood-friendly Qatar has also stepped back from Hamas, limiting its funding projects in Gaza to civilian reconstruction only, building a modern highway in Gaza and a fancy new neighborhood in Khan Younis. However, no Qatari funds go to Hamas's military build-up. Turkey's assistance to Hamas is limited, too. It paid for a new Gaza hospital and 11 mosques, but beyond that, its support is mostly rhetorical. The Arab world is indifferent to Gaza, meaning that Hamas is in strategic distress. ISIS-inspired ideology is penetrating Gaza, and a few thousand former Hamas, Fatah, and Islamic Jihad members have defected to small Salafist-jihadist groups there. These groups have been responsible for all rocket fire into Israel since the summer of 2014. In fact, the only state that makes major efforts to care for Gaza's civilians is Israel. Israel provides 60 percent of Gaza's electricity (30 percent is locally produced and Egypt provides the remaining 10 percent). In 2015, Israel allowed 104,000 Gazans through the Erez border crossings to assist traders and humanitarian journeys. At the Kerem Shalom vehicle crossing, 900 trucks pass each day from Israel into Gaza, carrying all manner of goods, from fuel, to construction materials and commercial goods. For Gaza civilians, the only ray of light seems to shine from the reconstruction mechanism, which Israel quietly set in motion after Hamas cynically used Gazan civilian areas as rocket launching zones and urban combat bases. Israel set up a computerized reconstruction system that closely monitors and enables the rebuilding, while preventing the use of concrete and dual use items from falling into Hamas's hands. Gaza contractors who cannot account for their materials on the computerized systems are immediately removed from their positions, a heavy price to pay in the unemployment-rife Gaza Strip. Funded by international donors and the Palestinian private sector, the mechanism, which Israel pushed to set up, has repaired 80,000 of the 130,000 housing units damaged during the conflict. Another 20,000 are currently being repaired. Of the 18,000 homes completely destroyed in 2014, nearly 11,000 have already been rebuilt, and material for nearly 2,000 more homes has been bought and paid for. The reconstruction program is providing jobs and a little hope for Gazans. But it is unlikely to be sufficient to stave off an economic collapse. Again, the rebuilding effort is funded almost entirely by outside sources while Hamas invests tremendous resources into terrorism-guerilla capabilities and denies the Gazan people the opportunity of economic development by refusing to recognize Israel. Until Gaza is run by people with different priorities, its residents have little hope their lives will improve. "Thirty percent (910,000) of Gaza's population of 1.85 million are aged 15 to 29" should be "Fourty nine percent (910,000) of Gaza's population of 1.85 million are aged 15 to 29"
Has Gaza been assessed for the rising support of Daesh in the area? Frankly, Hamas is an on-going concern, but I am curious as to whether it has been confirmed if local support in Gaza is also for that of Daesh? I ask this for good reason. Maybe Mr. Lappin could email me in regards to this?